Since Im still nursing I haven't been using any supplements such as protein powder. I've been getting additional protein into my diet by using different nuts. This smoothie recipe is one of my favorites. It's simple, just 3 ingredients and really tasty. 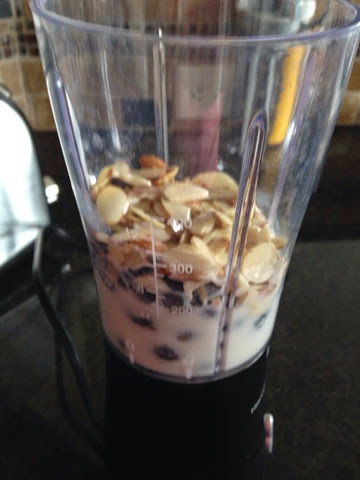 I use frozen blueberries, a handful of sliced almonds and almond milk. Just blend it well. I usually drink this in the morning as a snack between breakfast and lunch. I'm hungry all the time and this smoothie helps curb that hunger. This is the blender I use for my personal smoothies. It works great and was really inexpensive.